‘Tis the season! With Christmas less than three weeks away, we’re in full on “deck the halls” mode around here. I’m a little bit behind this year (bad blogger/mom! ), but it’s all happening this week! Trees will be going up, lights will be twinkling, stockings will be hung, cozy pajamas will be worn, and so on and so forth. I do always love hanging a few wreaths… one on the front door, maybe a few inside, and sometimes one placed flat on a table. And certainly, there are plenty of pre-made wreaths readily available online. However, I was feeling the crafty bug and wanted to try my hand at making my own wreaths this year! 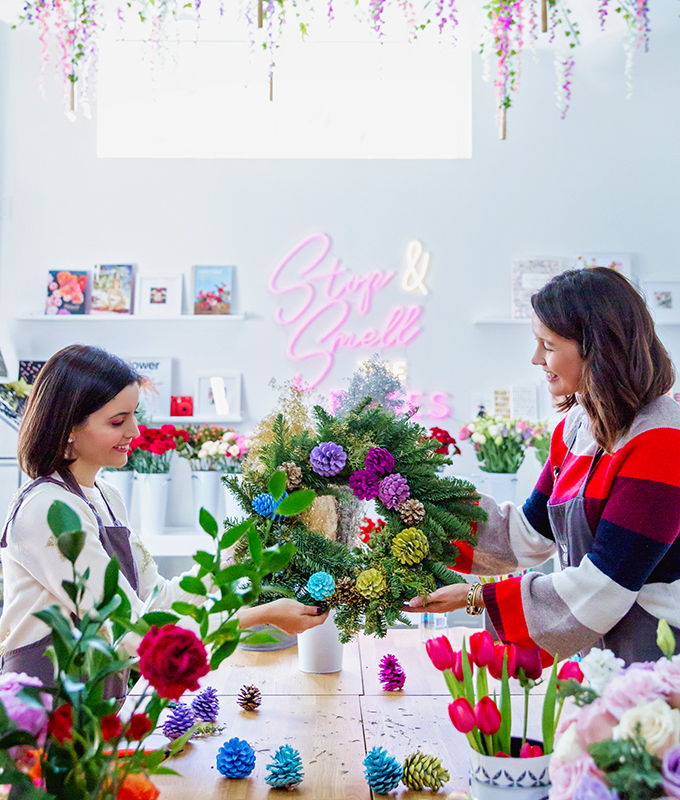 And anytime I want to get creative with florals and greenery, I entrust myself to my sweet Layla from JoyBox Flowers, because everything she touches turns to proverbial gold. Truly, her floral creations are exquisite. And I am glad that we made both, as it served as a lesson of sorts for me in the two extremes of DIY wreath ideas. 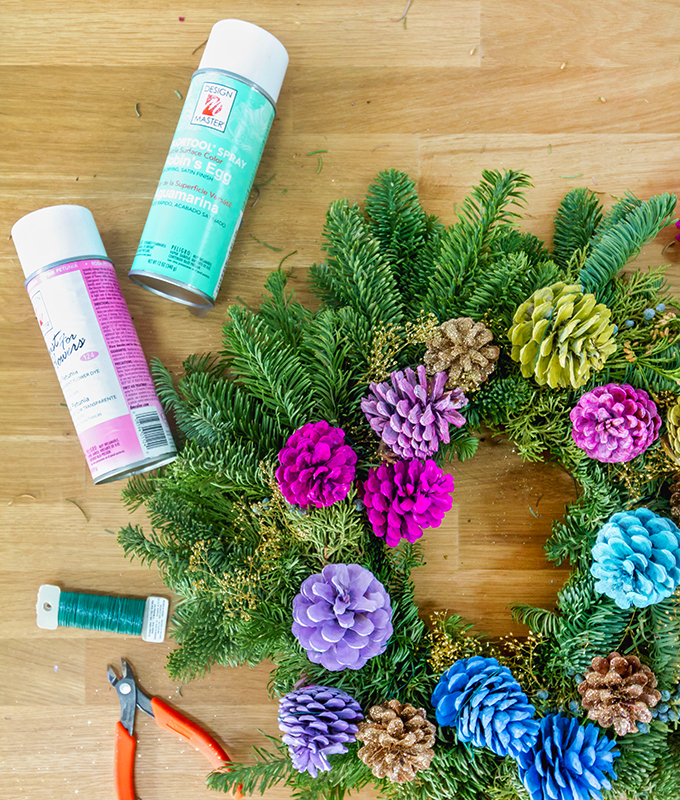 Certainly, there are a plethora of DIY wreath ideas out there. But we each end of the spectrum! The results? Both beautiful in their own ways. 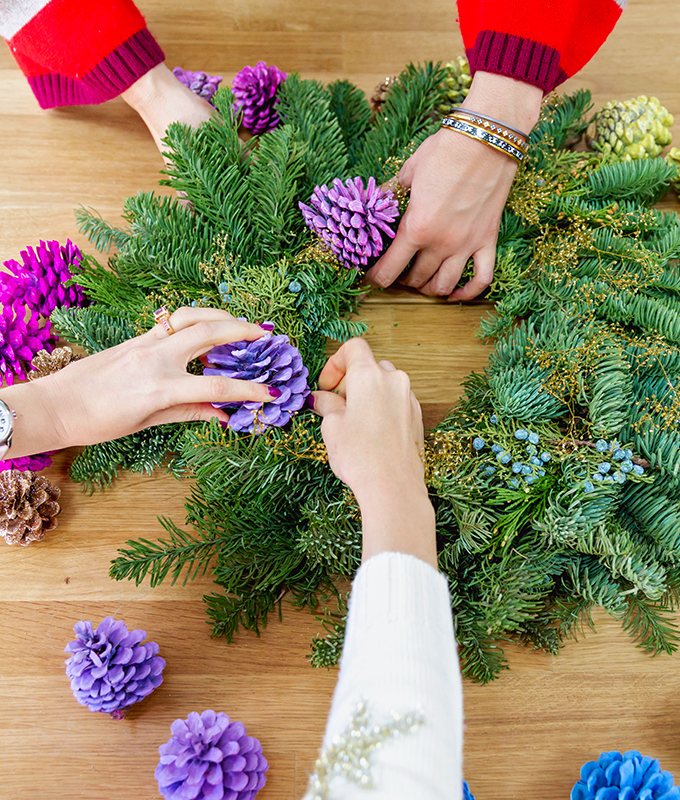 Keep reading for not only the how-to steps for this, but also considerations and pros and cons for each type of holiday wreath. 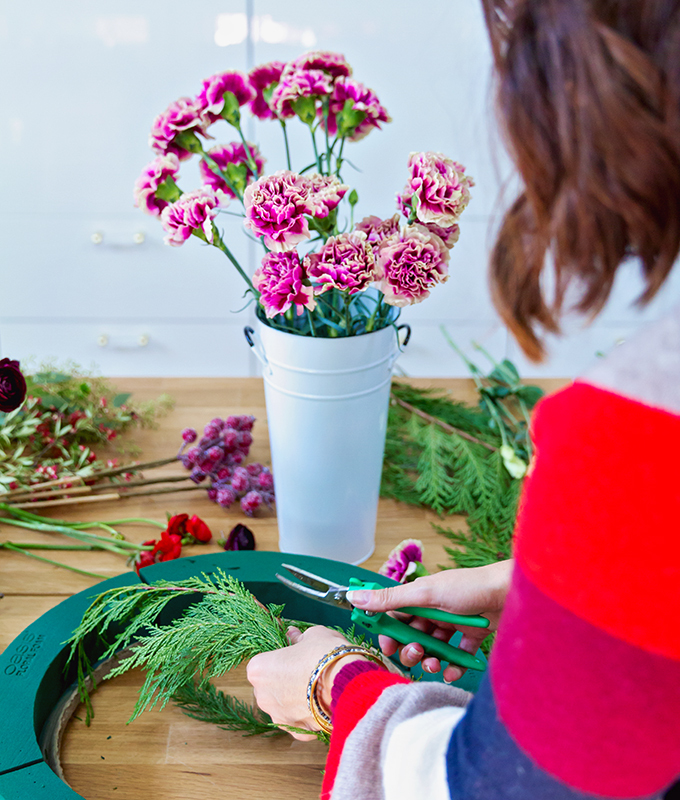 The easiest and quickest way to create a wreath is to simply buy one from the store and dress it up. This is very cost effective, too. 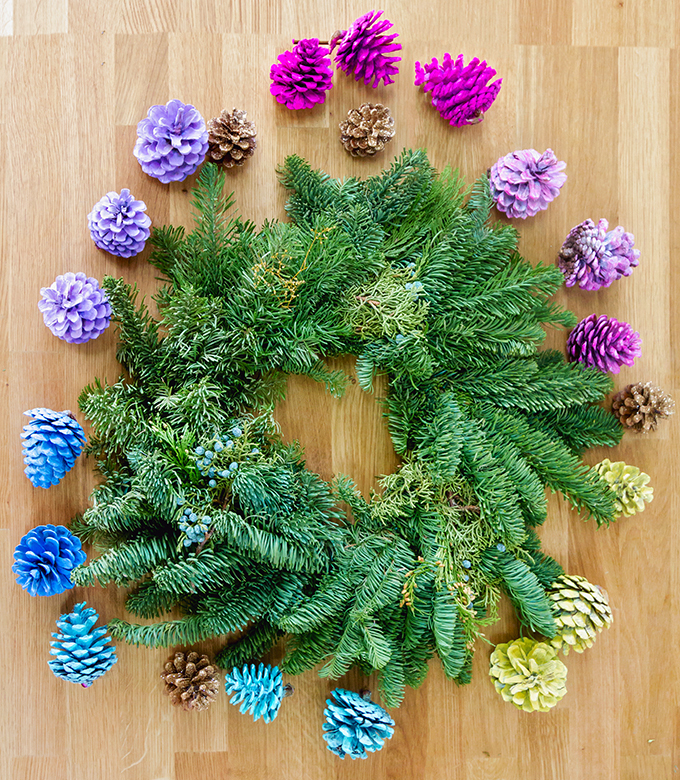 It should come as no surprise that we wanted our wreaths to be rainbow-inspired, so we spray painted pinecones in various colors and attached them to the wreath. Like I said, easy! This one will also last quite a while, which is certainly a plus. 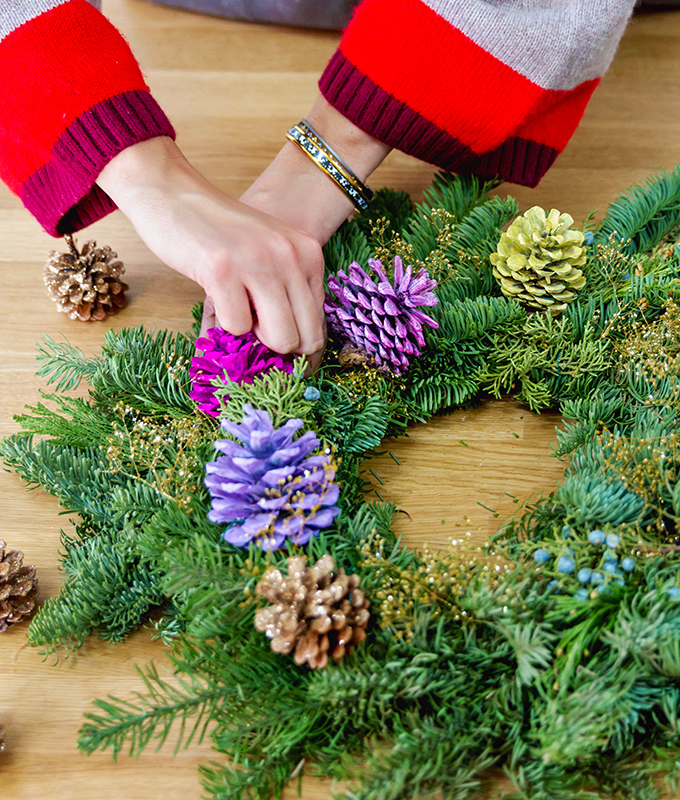 Below Layla gives the step by step instructions and supplies needed to dress up your own store bought wreath. 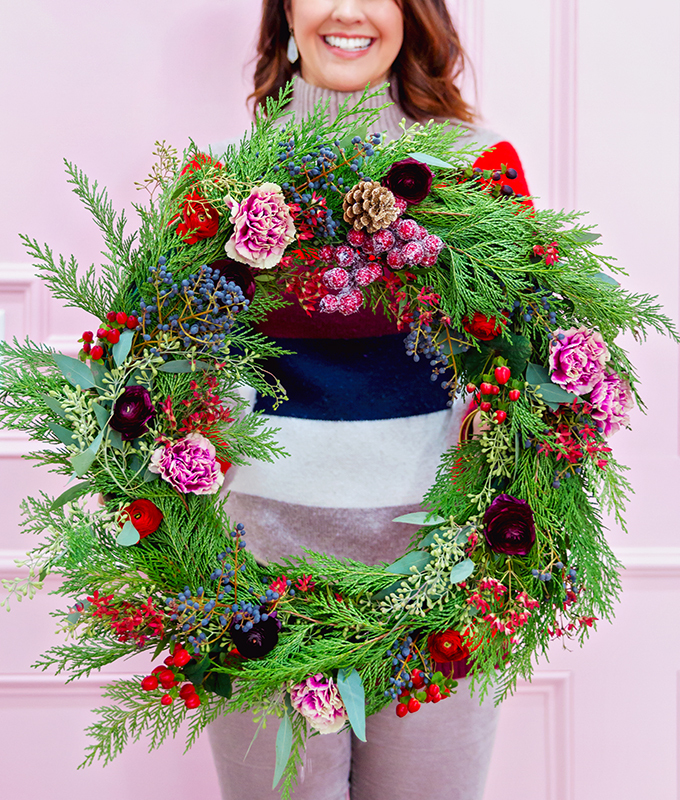 Start with a pre-made wreath. You can buy these at any grocery store or other retail establishment this time of year. We used a cedar one. These wreaths are not in any type of water or foam so they will dry over time. 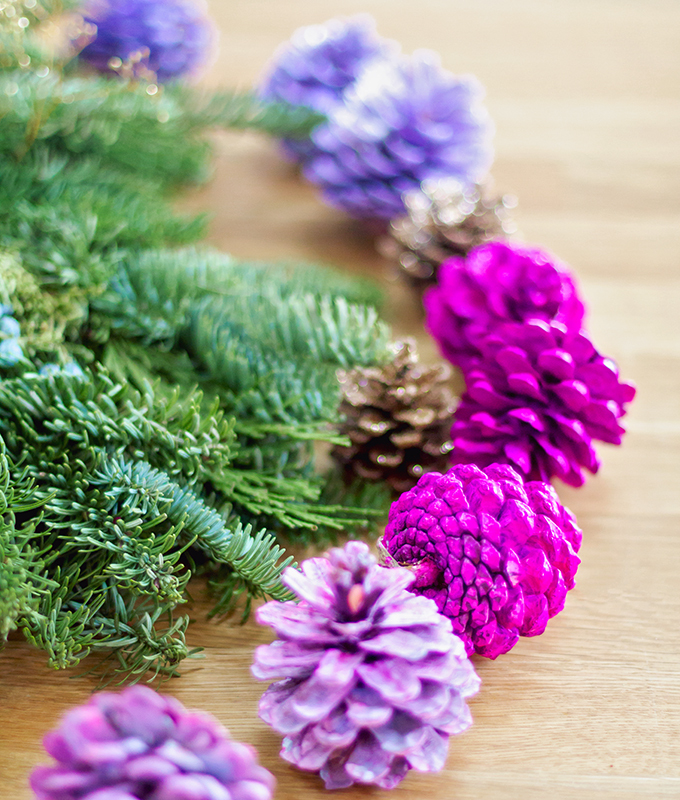 Spray paint the pine cones in any colors of your choosing. Of course, Carrie chose a rainbow of colors! 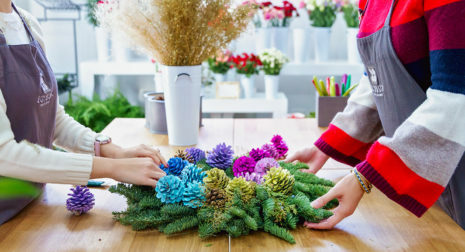 Once dry, wrap each one with floral wire and then secure it to the wreath by wrapping the end of the wire around the stems and base of the wreath. We made an ombré gradient around the wreath starting with bright pink and then yellow and moving to blue. But of course you can decorate it however you’d like! – Inexpensive: it’s a relatively inexpensive option! – Easy to create: this option is relatively simple to execute. No special skills required. – Fun project for the whole family! – Will last quite a while; you can enjoy this one for most of the holiday season! 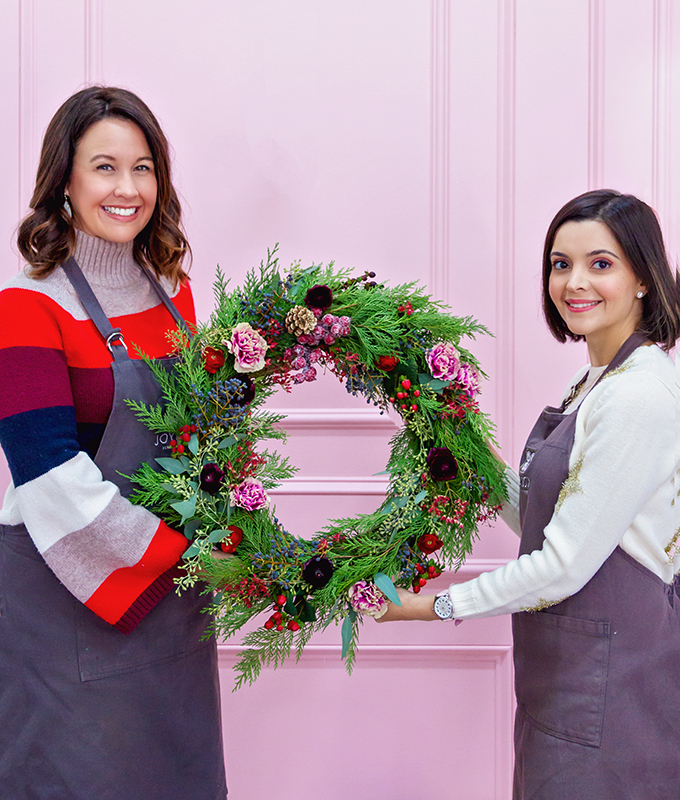 Now, for the option of a more luxe wreath full of fresh flowers… I had never made one from scratch, so I was happy to learn from Layla on this one! And you know what? It wasn’t as difficult as I expected. By nature of the live florals, this one will only last a few days. 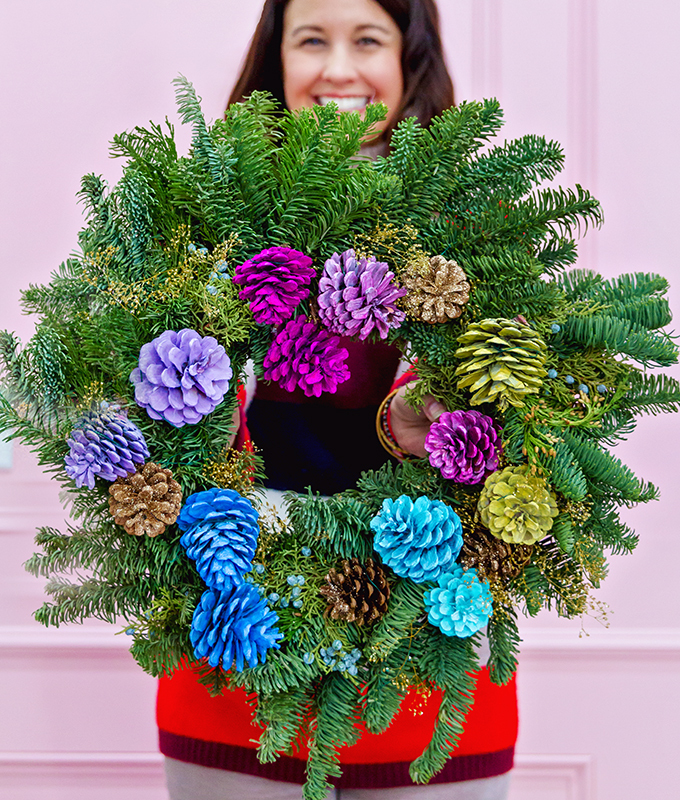 But if you’re hosting any holiday parties or gatherings, this made from scratch wreath will really be a special touch! I currently have laying flat on the dining room table with candles filling the center. It’s truly stunning! 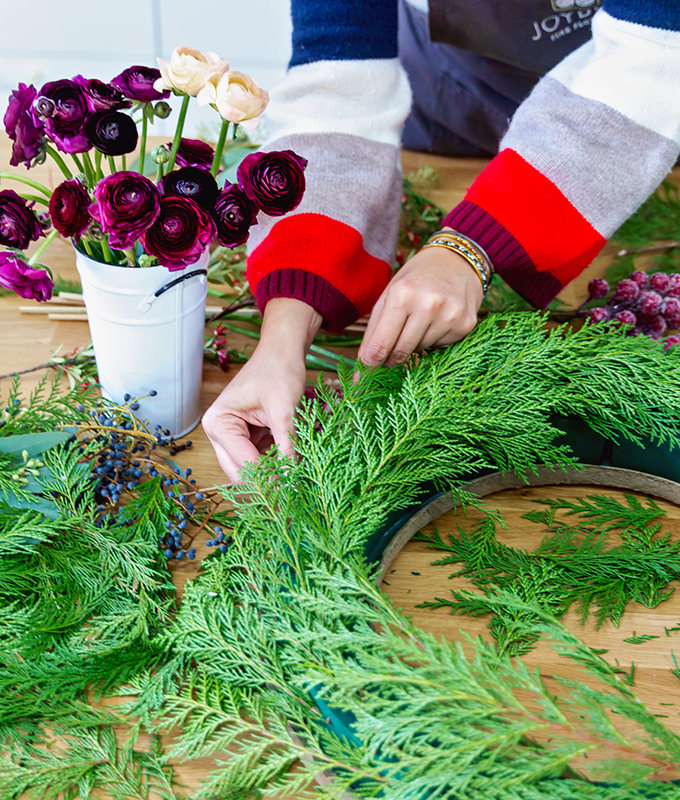 Below Layla gives the step by step instructions and supplies needed to make your own luxe wreath with fresh flowers. First, soak the floral foam in water per instructions. Then, Begin by layering your favorite greens in bunches. We went with Port Orford cedar, seeded eucalyptus, and privet berries, and we added hints of Christmas bush (what you see in red in the photos). Next, snip off bunches of each and layer all in one direction going around the wreath until you make your way back around the circle. 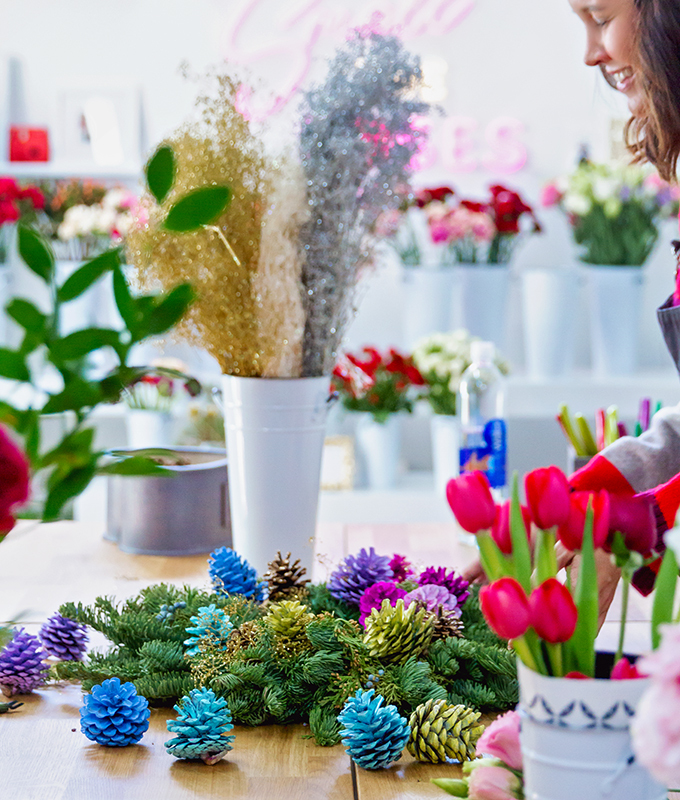 Start adding the fresh flowers. 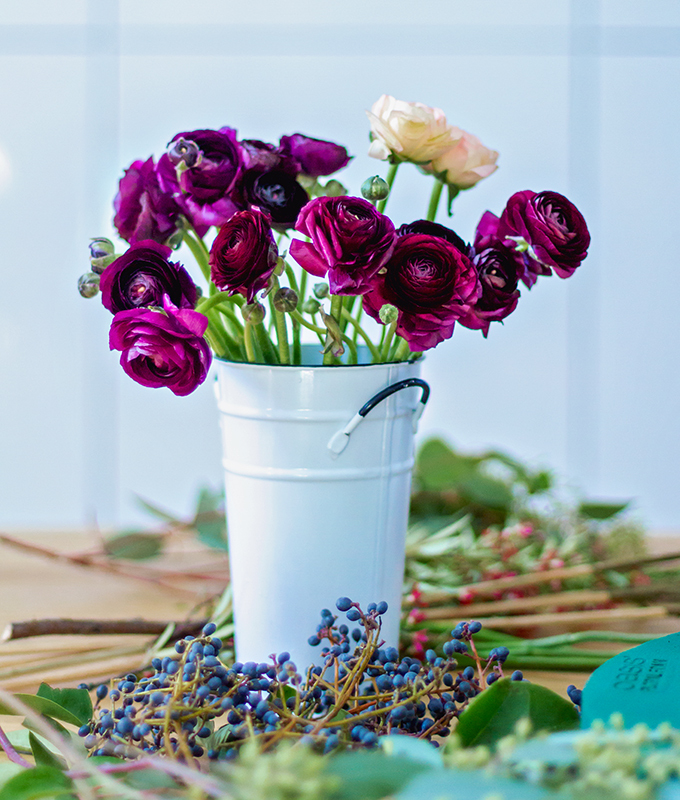 We chose specialty bicolor carnations, ranunculus in deep purple and red, and also preserved rose hips. You can use any fresh flowers you like and cut the stems to about 2 inches and insert into the foam between the greens. 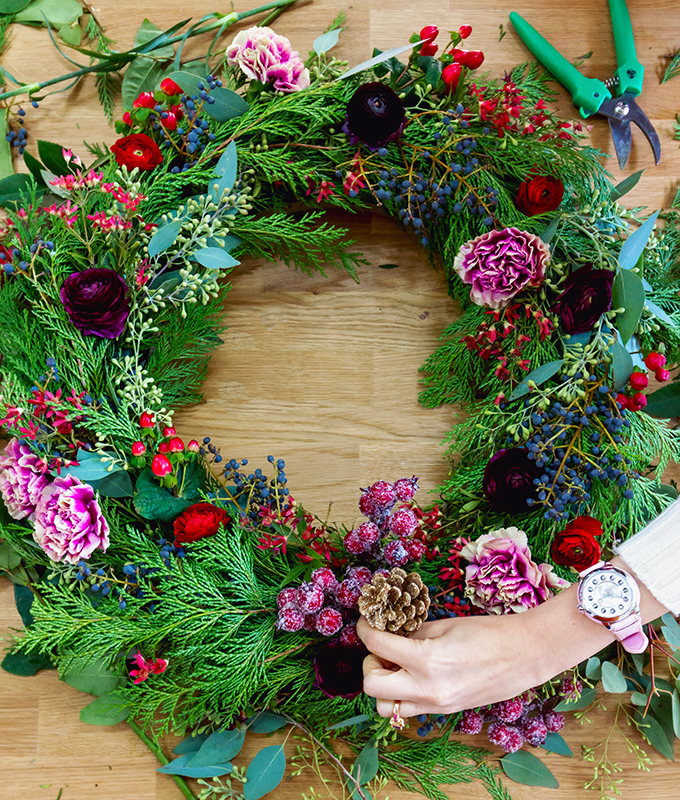 Evenly distribute the flowers throughout like we did to give the wreath a balanced look. 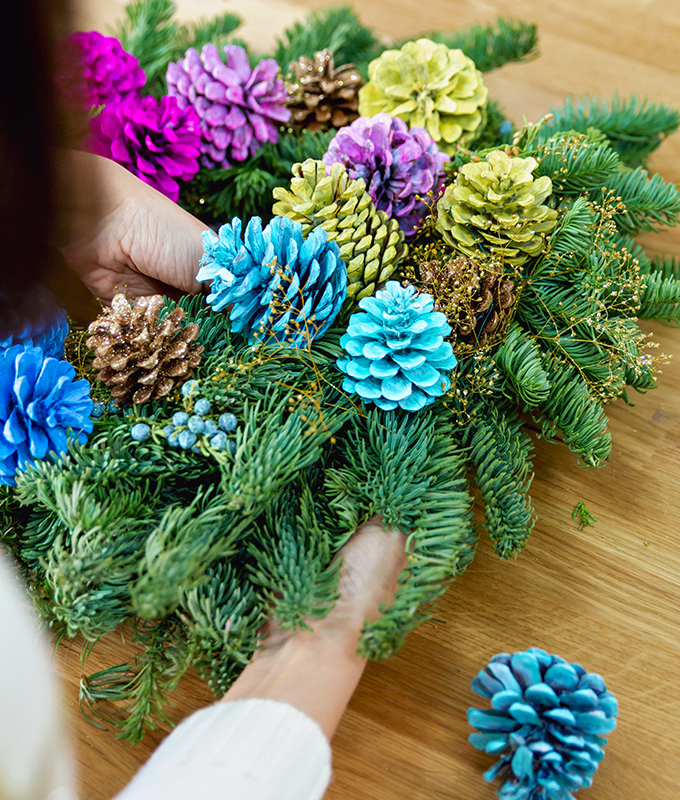 Finish off the wreath with a glittered gold pinecone, if you’d like, and secure with floral wire. You can use this as a table wreath or hang it up. 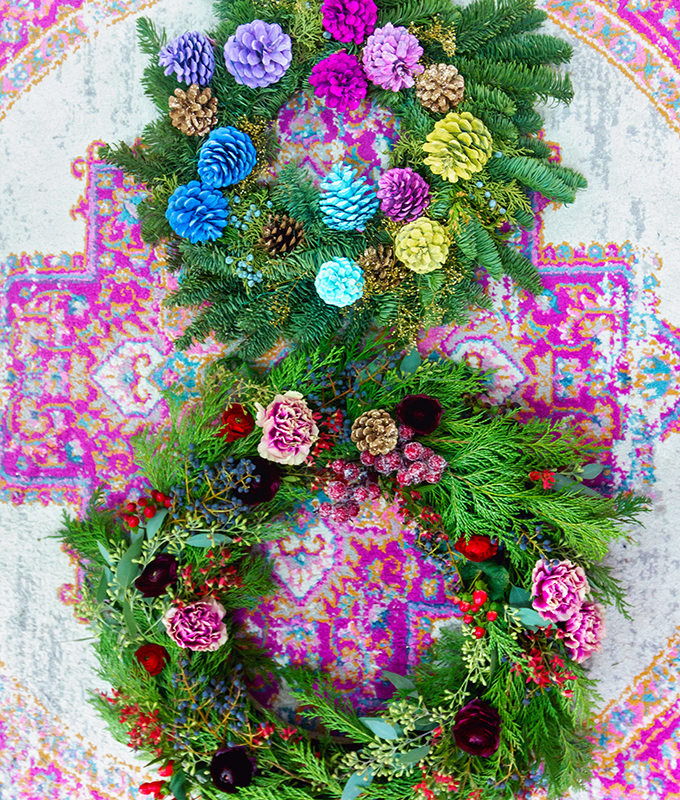 What’s your favorite type of Christmas wreath? Do you typically buy yours and put them up as is or add extra adornments to it? We’d love to hear in the comments below. And if you create one this year using inspiration from above be sure to tag us so we can see your creations! 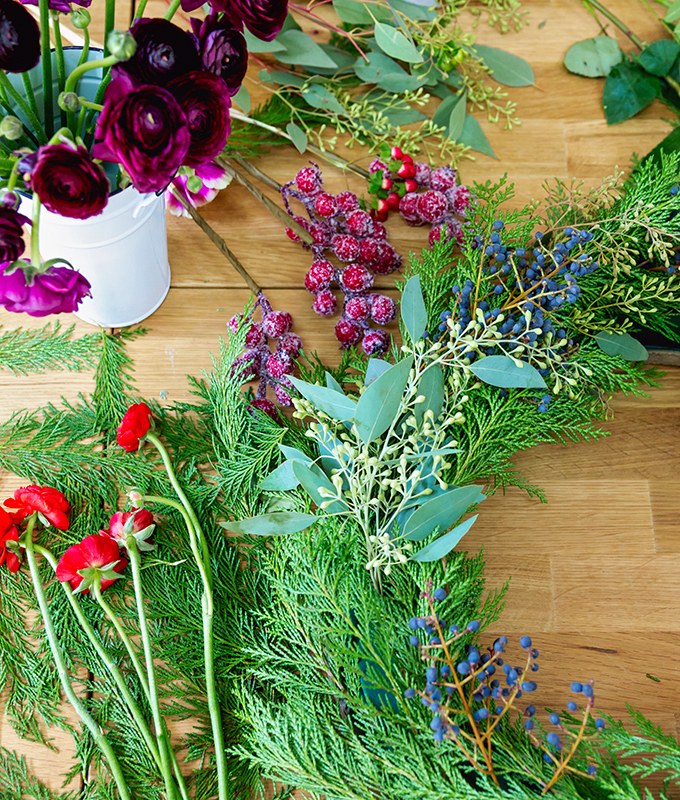 We want to give another huge thank you to Layla of JoyBox Flowers who always brings our floral dreams to life! 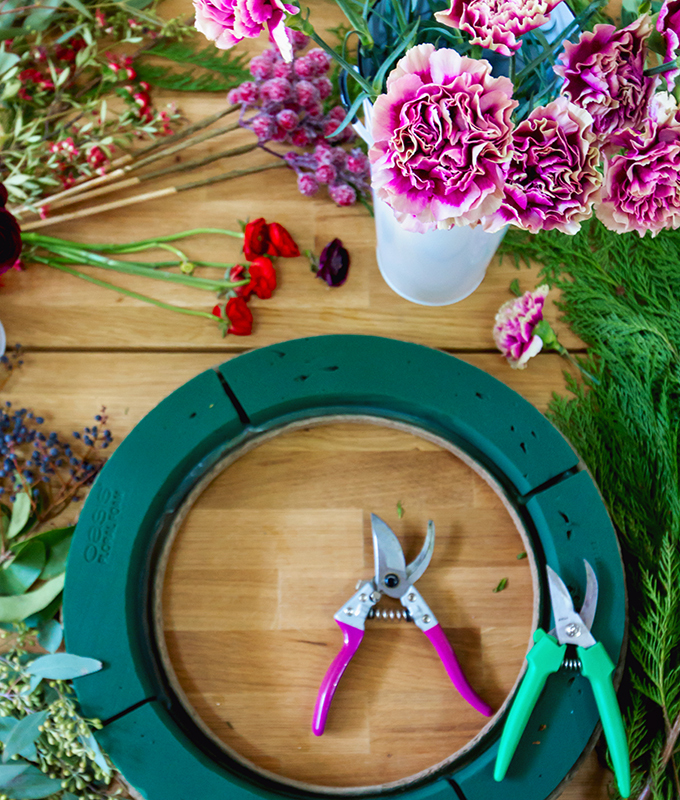 And if you aren’t looking to create your own wreath, JoyBox sells beautiful custom wreaths, and you can call the studio for more information. Have a great day and we hope your holiday season is off to a wonderful start.